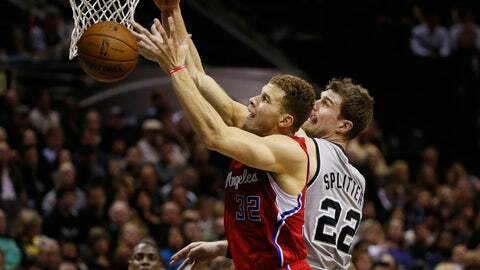 SAN ANTONIO (AP) — Tiago Splitter had a season-high 22 points before he was hurt, Tim Duncan added 19 points and 11 rebounds, and the San Antonio Spurs beat the Los Angeles Clippers 116-92 Saturday night in their first game without injured All-Star Chris Paul. Tony Parker had 17 points, Manu Ginobili added 15 points and Kawhi Leonard had 10 points for San Antonio (26-8). Splitter left with 9:37 remaining, injuring his right shoulder after charging into Ryan Hollins’ chest. Jamal Crawford scored 24 points, Blake Griffin had 19 points and Darren Collison added 14 points and six assists starting in place of Paul, who separated his right shoulder Friday night against the Dallas Mavericks. Los Angeles gave up 70 points in the first half for the second consecutive night, but rallying proved tougher to do against a 35-point lead than the three-point deficit they faced against Dallas. While the Clippers understandably stalled without their leader, who is expected to be out three to five weeks, the rest of their game disappeared, too. Los Angeles had just one rebound in the first quarter while allowing San Antonio to score a season-high 37 points. After Collison’s jumper with 2:20 left in the first, Los Angeles didn’t score again until Matt Barnes’ layup with 9:40 left in the half. San Antonio extended its lead to 70-35 at the half, its season high for point in an opening half. NOTES: Spurs F Boris Diaw missed the game with an undisclosed illness. . The Clippers’ Stephen Jackson received a mixed reaction upon entering the game in the final 2 minutes. Jackson was waived late last season after reportedly butting heads with Spurs coach Gregg Popovich. . The Spurs’ public address announcer mistakenly screamed "Manu Ginobili" in the opening minute of game, crediting him with an assist on Tiago Splitter’s basket even though the guard had yet to enter. The assist actually belonged to Marco Belinelli, Ginobili’s friend and former Euroleague teammate. . When the shot clock resent incorrectly late in the third quarter, Rivers asked if they could start over. After official Monty McCutchen said they would reset it, Rivers said, "No, can we start the game over?"